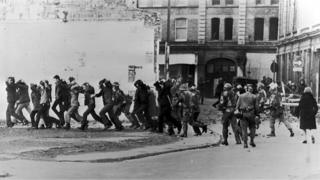 Bloody Sunday was the name given to Sunday 30 January 1972 after paratroopers opened fire on a civil rights march in Londonderry, killing 13 people and wounding 15. Forty-seven years later, prosecutors have announced one former soldier - Soldier F - has been charged with the murders of James Wray and William McKinney. He has also been charged with the attempted murder of four other men on the day. Director of Public Prosecutions Stephen Herron said there was insufficient evidence to prosecute 16 other former soldiers and two former Official IRA members involved on the day. "I'm relieved that that's happening obviously as we've been fighting for 47 years. "But I'm very saddened for the other Bloody Sunday families who have not got justice here today and whose hearts must be broken and sore now. "It's been a sad day, but one obviously that the Wray family are relieved [to see] in relation to our deceased brother. "There are a lot of sad, sad and heartbroken people today." "We are indebted to those who served with courage and distinction to bring peace to Northern Ireland, and I have the deepest sympathy for the suffering of the families of those who were killed on Bloody Sunday and all those who lost loved ones during the Troubles. "Everyone agrees that the current process for investigating the past in Northern Ireland needs to be reformed. That is why we need to get the institutions to investigate the past set up quickly and completed as soon as possible. "We will set out how we intend to move forward shortly. "As this is now an ongoing legal matter, it would be inappropriate to comment further." "I just feel let down by a law and a justice system that's supposed to protect people and bring anybody to book for crimes they've committed in the past - and it's just not happened. "The most difficult thing I had to do today was to call my children and tell them that there are no prosecutions for their granda and uncle." "We are indebted to those soldiers who served with courage and distinction to bring peace to Northern Ireland. "The welfare of our former service personnel is of the utmost importance and we will offer full legal and pastoral support to the individual affected by today's decision. "This includes funding all his legal costs and providing welfare support." "No soldier should be charged. It happened 47 years ago, a line in the sand needs to be drawn and people need to move on. "Under the terms of the Good Friday Agreement, veterans are being left open to prosecution while terrorists have been cleansed of their past crimes." "We've had a terrible disappointment. "We have walked a long journey since our fathers and brothers were brutally slaughtered on the streets of Derry on Bloody Sunday. "Over that passage of time all the parents of the deceased have died - we are here to take their place. "The Bloody Sunday families are not finished yet." "Everyone deserves justice, including those whose loved ones were murdered by the British state." He said it was "disappointing" for families who had not received news of prosecutions, adding: "we are mindful of those families who received that news today, and believe me, there are many. "For us here today it is important to point out that justice for one family is justice for all of us." "We have terrorists who are being treated better over their despicable actions. "The very thought that one man now out of all of those involved - from politicians to generals to soldiers on the ground and of course those people who were provoking the situation on the other side - only one man is being held culpable for everything that happened pretty much. "I suspect the real chances of a successful prosecution against this man is very low after almost half a century has passed." "While we as a group of families and individuals may have differing views on whether or not the soldiers who carried out the shootings should face jail, or how long they should spend in jail, we are all agreed that they should face the due process of the law. "And they should do so in public. "The very few British soldiers that were charged during the conflict here were named, and the same should apply to those being charged now. "Killers should not benefit from anonymity." "When events which occurred on what became known as Bloody Sunday are focused upon, they are taken in isolation from what occurred in the days leading up to 30th January. "The Saville Report ignored those events, including the murder of two RUC officers Sgt Peter Gilgun and Constable David Montgomery, gunned down by a Provisional IRA sub-machine gun in the vicinity of the march just three days beforehand. "There is still a disproportionate focus on the small proportion of the 10% of deaths attributed to those who were attempting to serve the community in difficult and often very dangerous situations." "It's a victory for the families and a victory for them is a victory for us also. "I'm a bit disappointed that just one soldier was charged. "But I don't think the fight is over, I would hope the fight is not over, for families like ourselves [the Ballymurphy families], we are here today in solidarity with the Bloody Sunday families like they have supported us for many many years." "There is of course huge disappointment that only one former soldier has been charged with two counts of murder and four attempted murders. "But even the fact that one former soldier is to face trial is a significant achievement. "I also commend the dignity and solidarity shown by the families today in response to the decision. As they said themselves, justice for one family, is justice for them all." "This campaign for truth, justice and accountability has been met with prevarication, equivocation and obstruction at every level. "In sharp contrast, the unshakeable dignity and solidarity of the families has been immense. "I welcome the decision to prosecute Soldier F. The absence of prosecution for others is not, however, a vindication of their actions. They remain unjustified and unjustifiable." "An abject failure to govern and legislate, on our watch as a Conservative administration. "When I speak of a chasm between those who serve and their political masters in this country, I mean this." "Every civilian who died or was injured on Bloody Sunday was an innocent victim who posed no danger to anyone. "My thoughts are with all of their families right now. "A decision has been made today to pursue a prosecution and it is very important that no one prejudice that process." "It's a very bittersweet day for our clients. I have five families who got great news today, I have 17 families who got crushing news today. "They are very clear legal avenues that are open. "What we do now is submit further submissions and ask for the decisions not to prosecute to be reviewed. "If the reasons given by the Public Prosecution Service do not withstand proper legal or judicial scrutiny we then challenge by way of judicial review in the High Court." "What we also need to learn today is that the criminal justice system is not the place to deal with legacy. "This is another confirmation of that which we have known, but which we have failed to grasp and which we fail to tackle. "Every time that people end up in the judicial process it's about innocence and guilt and it's very difficult to do guilt 45 years on." "The PSNI looked at the evidence, passed it to the PPS and they decided - based on the evidence - to prosecute one former soldier. "This is the law, it must be respected by all and it is now for the Courts to decide. "I have long said nobody is above the law and nobody should be held to a greater or lesser standard than anyone else. "My thoughts remain with the families of all the innocent victims of the Troubles." "In emotional terms this is not the end of it, that's certainly true. "You would only have to be here and see the distress of some of the Bloody Sunday families. "Legally we haven't entirely run out of road yet, politically of course, many people including myself have been pointing out that the only people being considered for charges were lower ranked soldiers." "I think it would be nice for everybody if we started to hear about some of the IRA terrorist cases being reopened and some of them being put on trial. "It's very important that if we're going to have a process like this, that IRA men are also investigated and where necessary, where there is the evidence, prosecuted as well. "It would be quite wrong simply to prosecute those who served." "We'll make a decision on where we go from here and take advice on what further courses of action are available to us, if any. "There won't be any hasty decisions. "We're absolutely delighted for the families who have achieved a degree of satisfaction with the prosecution and we'll look forward to supporting them through that and we'll see where it goes from here." "In this case, this man went out to serve his country a very long time ago. "Mistakes were made, clearly, possibly by him, mistakes were made by his superiors, but they were mistakes. "They were not acts of deliberation and I think people should bear that in mind and he shouldn't go to court for that reason." "In 1972 we also had Bloody Friday, but IRA murders don't count it seems when it comes to this distorted dealing with the past. "The pursuit of soldiers while terrorists continue to go scot-free is now very much part of the rewrite of history so promoted by IRA/Sinn Féin." "It's absolutely disgraceful. I did two emergency tours in Londonderry and south Armagh and there were procedures in place to deal with any wrongdoing."